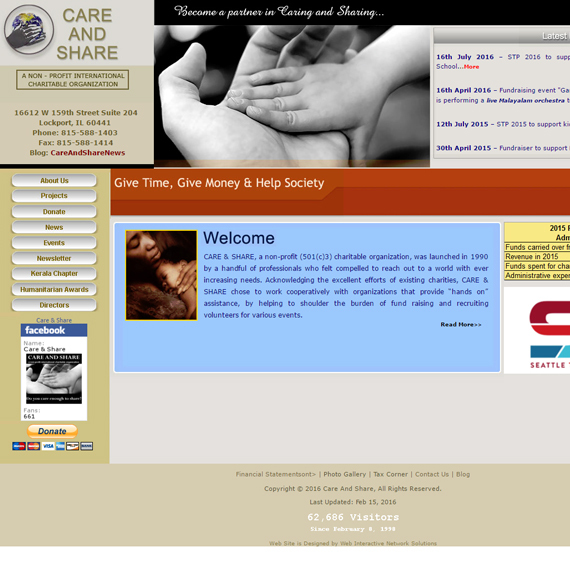 Care & Share, a non-profit 501(c)3 charitable organization, was launched in 1990 by a handful of professionals who felt compelled to reach out to a world with ever increasing needs. Acknowledging the excellent efforts of existing charities, Care & Share chose to work cooperatively with organizations that provide “hands on” assistance, by helping to shoulder the burden of fund raising and recruiting volunteers for various events. During first decade of its operations Care & Share mainly supported the projects in United States. It reached the homeless and hungry through partnerships with local charitable organizations such as Olive Branch Mission (Chicago’s oldest charitable agency), Living Light Outreach Center in Englewood, Daybreak Family Support Center, Morning Star Mission in Joliet, Apna Ghar (Our Home) in Chicago and weekly feeding program at the People’s Church in Chicago. Care & Share also conducted free eye clinics and free distribution of eye glasses for the most needy people. Starting 2000 Care & Share is more focusing on projects in India especially in Kerala State. A Kerala Chapter was formed in year 2002 and spearheading in various social welfare programs. We support orphanages, pain and palliative care units, cancer and chronic kidney patients, help poor students with scholarships to achieve their higher education dreams and conduct regular medical camps for the early detection of eye problems and other diseases such as Asthma, Chronic Kidney Diseases, etc.